It is estimated that some 20 million students are going to college this fall and that unfortunately some 12 million of them will be required to take out student loans to pay for their educations. Unless you’ve been hiding under a rock, you probably already know that student debt stands above $1 trillion making it even larger than our national credit card debt. Colleges and universities are not making things any easier either. The average tuition has increased 27% at public universities and 14% at private schools in the past five years, which would help explain why people are graduating owing an average of $25,000 or more. But regardless of whether you’re just starting college or are already in school, there are things you can do to keep student debt from ruining your life. In the event you’ve already started college this advice may come too late. But if you’re still a high school senior you should try to choose the most affordable school you can. This may not be the most prestigious of colleges but what many people have found is the secret is to go to an affordable school for four years and then get their graduate degrees at a more prestigious college or university. Another way to keep from piling on so much debt it would ruin your life is to go to a community college for two years and then transfer to a more prestigious school. Whether you start at a two- or four-year college you’ll probably be required to take basically the same courses for the first two years so you really have nothing to lose by starting at a local community college. As an example of what this can mean, the cost to attend one of our local community colleges for a year is $6832 while the cost for an in-state student to attend our state university is $26,933. Do the math and you’ll see you would save approximately $40,000 by doing your first two years at the community college. Even if you’re already in college it’s not too late to consider changing majors if you’ve chosen one that would doom you to being a low earner for years. Recent studies have shown that if you get a degree in child and family studies, elementary education, exercise science, broadcast journalism or animal science you will be a low earner for life. For example, even the mid-career salary for a person with a major in child and family studies is just $37,200 and for elementary education it’s $45,300. The starting salary for a person with a major in exercise science is $32,600 with an estimated mid-career salary of $51,000 while the mid-career salary for a broadcast journalism major is just $68,800. Now compare this with the $100,000 or so that you will spend on your education and ask yourself the question would one of these majors be a good investment. Believe it or not there are colleges that offer better values just as there are automobiles that are better values and the names of some of the schools might astonish you. For example, Harvard University is considered to be a good value because nearly 60% of its students receive need-based grants so that the average cost to them is just $15,486 a year. Brigham Young University is also considered to be a good value because the average cost of attending there for a year if you receive need-based grants is just $12,367. And the cost to attend the Massachusetts Institute of Technology for a year averages just $19,957 assuming you qualify for need-based grants. Now compare this to the cost of attending our state university for a year of $26,933 with little or no opportunity to get grants and you should be able to see why it’s important to be careful about which school you choose. Fortunately, scholarship money being handed out by foundations, corporations and other private-sector benefactors has also risen as has tuition at universities and colleges. There are websites available that can help you and your family find scholarships for which you might qualify. However, it’s important to search early. If you’re a student your parents should check with their employers to see if maybe they offer its employees’ children scholarships. Don’t be afraid to aim high. Even though the competition for big scholarships can be very tough, you should give it a shot. They payoff can make it worth the effort. This is also an area where choosing a private school could be better than a public university. While it’s very difficult to score a scholarship from a public school it should be easier to get one from a private institution – just as it’s easier to get needs-based grants. As an example of this, the small private college I attended now costs – at least theoretically – a little more than $37,000 a year. However, 100% of its students receive scholarships or grants so that the true cost of attending it is clearly much less than the $37,000. If you owe $20,000, $30,000 or more in student debt you can still keep this from ruining your life. For one thing, you could get a federal Direct Consolidation loan, which could lower your monthly payments dramatically by giving you more time to pay off your debt. The other advantage of this is that you would have just one monthly payment to make a month versus the multiple payments you’re currently making. The interest rate on these loans is computed as the weighted average of the loans you’re consolidating rounded up to the nearest 1/8th of a percent. The simplest way to think of this is that if you get a Direct Consolidation loan, your interest rate will be higher than the lowest interest rate you’re currently paying but lower than the loan with the highest interest rate. In the event you aren’t eligible for Pay As View Earn, there are other options that could keep your student debt from ruining your life. The Income-based Repayment program would cap your monthly payments at 15% of your discretionary income or if you just recently graduated you might choose Graduated Repayment. This is where the payments start smaller but then gradually increase every two years. The long and short of it is that you can get a good college education without it ruining your life. However, you will need to make some smart decisions when it comes to choosing a school and choosing a major. 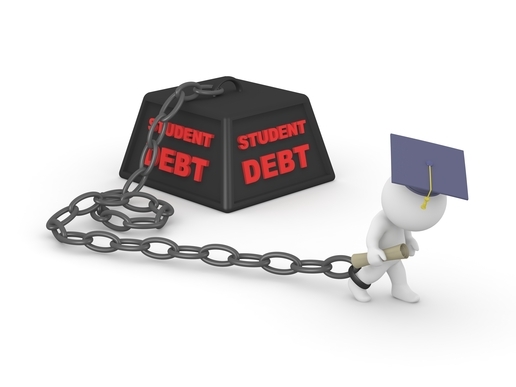 There are also options available that can make things easier in the event you have a considerable amount of student debt. As the old saying goes, “you don’t need to know a lot about money to be good with money.” The important thing is to think things through and make decisions that will enhance your life and not ruin it.